Please refer to the following Placement Chart to determine your child’s age appropriate grade. This is a starting point only—the placement test, and interview will assist Dalat’s Admissions Committee in finalizing your child’s placement in the most appropriate grade in our school. Space is available in the grade applicant is qualified to enter. There is space available in ESL for applicants determined to require ESL support. Students entering preschool must be three years of age on Aug 1, and first graders must be six years of age on Aug 1 of the current school year. The program needed by the student is available in the school. The students’ previous school records meet the academic requirements for admittance. ESL students will sit for an English language exam and their results must meet the school requirements and programs available. The parent and the student indicate that the daily Bible classes and the weekly chapel services will not be a problem for them and agree with the compulsory attendance regulation. The results of an interview, if deemed necessary, between the Admissions Coordinator and the parent and student are satisfactory. High School students from non-accredited schools will have their credits validated by examination or scholarship performance in Dalat International School. The placement of such students will be on a trial basis until proper validation of the previous credits has been attained. Acceptance Decisions are determined by Dalat International School’s Admissions Committee. The Head of School, Divisional Principals, Counselors and Admissions Coordinator form the Admissions Committee. For further information about admission to Dalat please visit our Admission’s FAQ’s. The non-refundable application fee of RM600 and testing fee RM200* (RM800 total-checks payable to Dalat International School Sdn Bhd). *If your child is at an American or International school that conducts annual standardized testing such NWEA MAP, please consult the admissions director on whether or not testing is necessary. Please have your child’s current school complete our online teacher/principal references. Ensure to include the Principal/Counselor Reference form. Include a photocopy of the birth certificate. Previous 2 years school records, including latest grades available and standardized test scores if available (not applicable for Preschool and Kindergarten applicants). Include a photocopy of the student’s passport. Include the Physical Evaluation form completed by a doctor, including immunization records. Include a photocopy of father’s and mother’s passport. Complete the Student Application form, include a recent photo, and submit them to the school with the application of 600 RM and testing fee of 200 RM (Grades K-12). Follow the instructions for having the supplementary forms completed and sent to the school (Teacher Reference Form, Principal/Counselor Reference Form, Student Immunizations, Physical Evaluation). Click the info icon above to view the Admissions Section of the Dalat Download Centre for further forms and information on admission to Dalat. For those applying to the boarding program, complete the additional Boarding Application (found in the brown section of the Application Procedure Page.) Send a photocopy of the picture page of the father’s passport, a copy of the student’s birth certificate, and four photos with blue background for the student visa. Click the info icon above to view the Boarding Section of the Dalat Download Centre for further forms and information on admission to Dalat. Ask your son’s or daughter’s current school to issue a complete transcript (for high school) or school records (for middle school and elementary) with most recent grades and have it sent to Dalat. An official transcript is required for High School credits to transfer, but an unofficial copy will be accepted for planning and scheduling. Click the info icon above to Download a sample Homeschool Transcript document if you need a template. If transferring from a North American school, submit a copy of your child’s most recent standardized test scores and any individualized educational plan. All applicants will be interviewed. Kindergarten Applicants and older will take a standardized test for admission. Applicants who have been determined to need or benefit from ESL Support will be required to enroll in ESL Support. Additional interviews with the divisional principal or ESL Coordinator might be scheduled. Depending on your son’s or daughter’s written and verbal abilities in English, he or she may need to take an English language exam which is administered on our campus prior to admission. If your child is transferring from a non-English speaking educational system (such as Taiwan, Korea, Japan or Thailand), he or she may need to sit for additional exams that will help us determine his or her appropriate grade level. 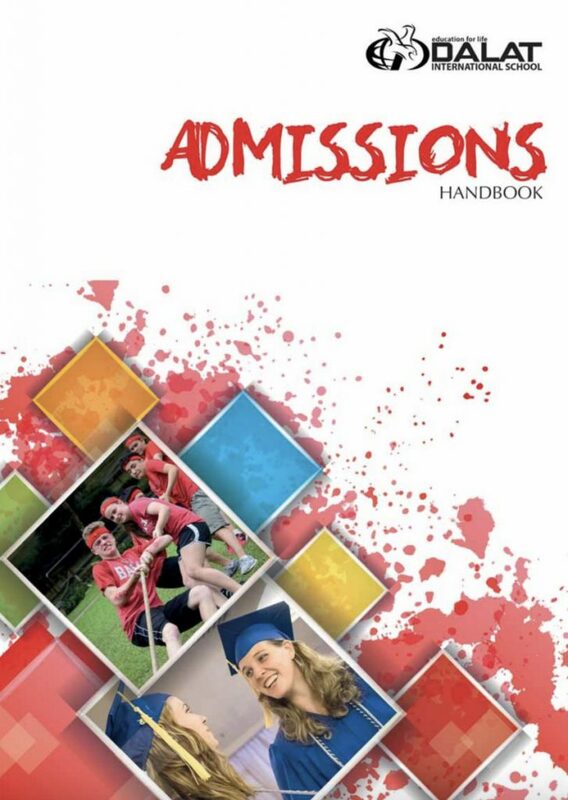 For more information about the requirements and procedures for admission into Dalat International School see our Admissions Handbook.